In a world where somebody bitten by a radioactive spider in an experimental laboratory with very little oversight gains super powers and dons spandex to save New York City from a rampaging lizard man, many fans felt that the most unrealistic element of The Amazing Spider-Man when it debuted theatrically in 2012 was the fact that Peter Parker used Bing, Microsoft's unpopular search engine, rather than Google in the film. Believe it or not, True Believers, this was a thing. People really made fun of the fact that ol' Webhead didn't prefer Google. Well, it seems as though the Amazing Spider-verse has come around, as well. 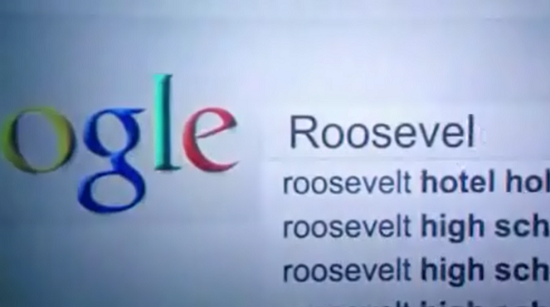 Following a Google Hangout with the cast and director of this weekend's hit release The Amazing Spider-Man 2, fans noticed that when Peter was searching for information on his parents and "Roosevelt" during the course of the film, he takes to the Internet and plugs some key phrases into a search engine to do it. 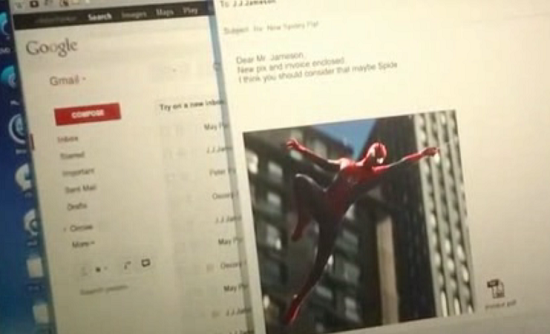 Even earlier than that, though, he's sending an invoice off to J. Jonah Jameson, urging him to consider that maybe Spider-Man ain't such a bad fella. And you can see that he's using Google's Gmail service. You can now go about your lives, secure in the knowledge that Peter Parker uses Google. And apparently, when he goes in for brand loyalty, he goes in all the way. Well, that and the fact that there's probably some money that changed hands along the way.